Why Do I See Quotation Marks in my Export? The quotes are there to keep your data aligned correctly. Virtuous exports data as a CSV, or comma-separated values, file. CSV is the preferred format for managing and moving data between systems, as others, like Excel, can cause changes to source data. However, since a CSV file uses commas to delineate where one field ends and another begins, having commas within a text field could be problematic. To deal with these embedded commas, CSV files use quotation marks to identify text that should be grouped together, so commas between quotation marks are not read as field separators. 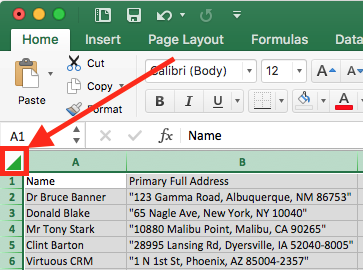 If you need to remove quotation marks from your export, you can do that quickly in Excel, for example, using the Find/Replace function. Then, type Control-F (this works on a Mac as well as PC) to open the Find/Replace dialog box. 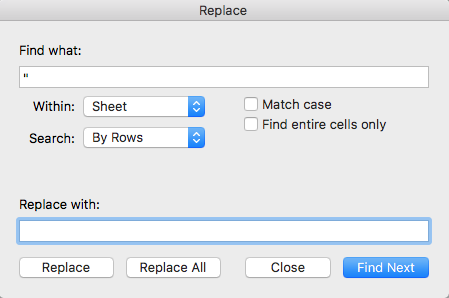 Type a quotation mark into the "Find" box and leave the "Replace With" box blank. Then click "Replace All," and you'll see a popup telling you how many quotation marks were removed from your file. Close the dialog box and the Find/Replace dialog, and you're all set!